Los Angeles BOOTIE LA: GLITTERAZZI! 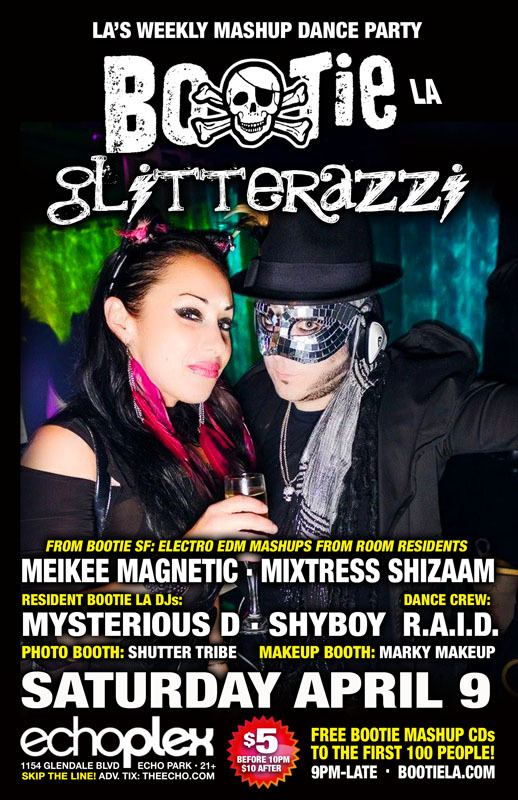 Glitterazzi, one of the room residents of Bootie San Francisco, comes down to LA to spin their patented brand of electro EDM mashups, joined by resident DJs Mysterious D and ShyBoy, as they all keep you sweating on the dance floor! Resident dance crew R.A.I.D. keeps your energy up with their go-go insanity, Marky Makeup decorates your bodies, and Shutter Tribe captures it all! Plus FREE Bootie mashup CDs to the first 100 people through the door!